Our professional dog trainer, Josh, offers on-leash walks Monday-Friday! Whether your dog is home alone for the day, boarding at our Bed & Breakfast, or playing at our daycare – Josh would love to take them out for you! Email Josh at bark@uptowndawg.com for inquiries! Does your pup ruv daycare but need more space to RUN? Send them on one of our Ranch Runs! 1.5 hours of off-leash fun at the Ranch in Anmore for just $15. Whether there is rain or shine, we don’t mind! We can take up to 10 dogs with a pick up and drop off at Daycare only. Dogs MUST be trained off-leash and have reliable recall. No reactive dogs please. Your pup will enjoy 2 hours of off-leash fun in the woods with up to 6 of their pals and one lucky Auntie! For drop offs at home, please ensure to leave out a doggie towel so our staff can wipe down your dirty pup before they enter your home! Our extra-curricular adventures provide your dog with the exercise, socialization and stimulation that they need and want. As a result, you’ll notice that your dog is calmer, displays less destructive tendencies, and is more content. Dogs MUST be trained off-leash and have reliable recall. No reactive dogs please. Pick up and drop off from daycare or your home (within 5 km) is included for $25. Daycare with a hike is discounted to just $15 for before/after the adventure! 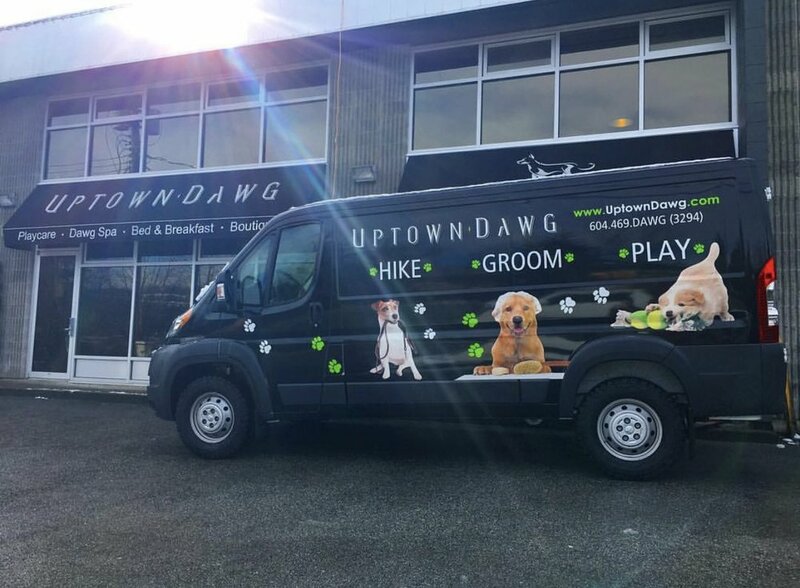 The Uptown Dawg van is fully equipped with A/C and heat to safely and comfortably transport your dog between our facility and wherever our destination might be!